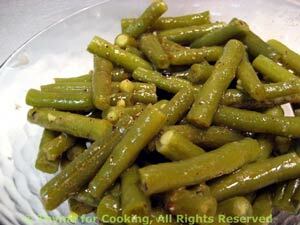 Summer Green Beans braised in Butter, easy Thyme for Cooking side dish. This is the easiest and freshest way to serve just-picked green beans. The olive oil keeps the butter from burning and the beans give off enough liquid when covered to braise nicely without sticking. Top and tail beans... cut off the ends. Cut into 2 inch lengths (5cm) or leave whole. Put beans, butter, olive oil in a small skillet and sauté over medium heat for 5 minutes. Cover, reduce heat and braise until done, 5 - 10 minutes longer, depending on thickness of beans.